500+ Creative DIY Projects to Help You Get Your Craft On! 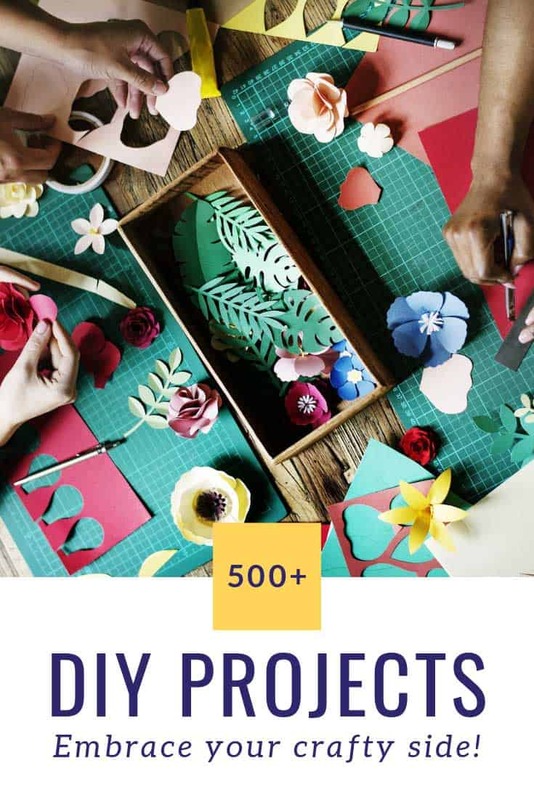 Home > DIY Projects > 500+ Creative DIY Projects to Help You Get Your Craft On! 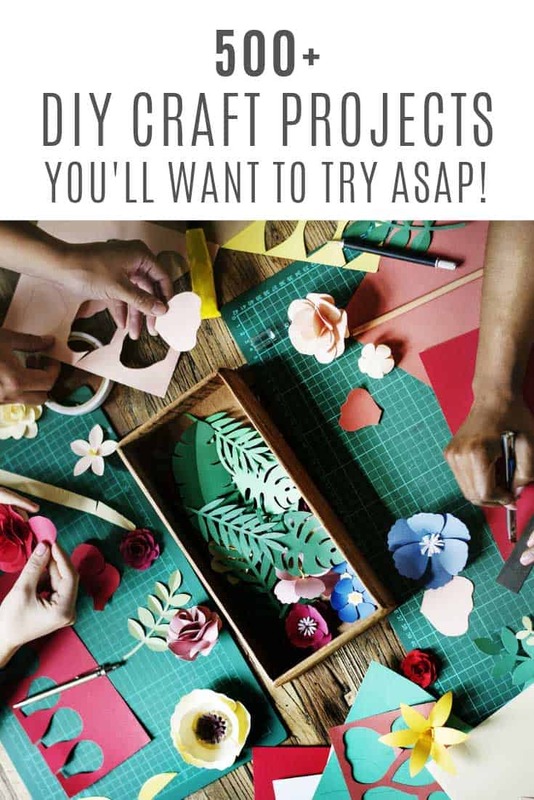 Crafting is a form of self care, so get crafty with our ultimate list of DIY projects that will inspire you to put you first. As a busy mom it can be so hard to take time out our day to do something that feels as frivolous as crafting. But here’s the thing. When we practice self care we are reminded that looking after ourselves is an important part of being emotionally and physically able to look after our families. Putting ourselves on our seemingly endless task lists sets an example for our children, of how we need to be kind to ourselves in order to be kind to others. Did you know that art has been scientifically proven to reduce stress levels? ’tis true. And here are four more reasons why you should take time out for DIY projects in the name of self care! One of the things I’ve struggled with since becoming a mom is no longer feeling like “me”. You know, the me I was before children. If you ever feel lost like this then art or DIY projects can help you redefine yourself. When you’re working on a project you will be picking out colors and patterns, figuring out what you like and don’t like. Even if you’re following a tutorial or a pattern you have a choice. Crafting encourages you to listen to your inner voice, and in doing so you are acknowledging that your inner voice is worthy. Being a mom can feel isolating at times, you might find your circle of friends shifts as you have children and then as they move from baby, to toddler to school aged. Craft projects allow you to connect with other people. You might do it online in a Facebook group, or you might do it in person at a local crafting group. It even allows you to connect with your family as you can show them the things you have made and talk about how they make you feel. It’s easy to become stuck on looking inside and feeling negative, especially when we’re tired and overwhelmed by our endless task lists. Once you embrace your creative side you will find yourself looking outwards. From something as simple as noticing the Spring flowers in your garden, or the vibrant colors in your daughter’s favorite dress. Setting aside time for DIY projects allows you to make beautiful things for your home, or to gift to others. You will find pleasure in making them as well as pleasure in looking at them as you move around your home. These days we are surrounded by “perfect moms” on Facebook, Instagram and reality TV shows. It can feel so hard to live up to those expectations. But the truth is real life is not like that. And crafting helps us see that. We make mistakes, things don’t line up quite right, we drop a stitch, but for all the imperfections we still create something that pleases us. Being creative allows us to embrace imperfection. If you need “permission” to set aside time in your day for DIY projects then let this be it. Art reduces stress, and crafting is good for the soul. If you’re ready to embrace your creative side take a look through this list of DIY projects you might like to try. This is an ever-growing list so be sure to save this post to your Pinterest account so you can come back to it when you need more inspiration. 11 Adorable Baby Shower Prizes Your Guests Won’t Just Toss in the Trash! 14 Genius Ways to Keep Your Kids’ Stuff in Check with Wooden Crates! 17 Fabulous She Shed Ideas You’ll Want to Escape to! 18 DIY Play Kitchens so Amazing You’ll Want to Cook in Them Yourself! 19 DIY Back to School Teacher Gifts That Are Super Cute! 25 Awesome Ways to Organize Your Home with Pegboards! 28 Crazy Cool DIY Refrigerator Magnets that Your Fridge Will Love You For! 29 DIY Table Runner Projects to Turn Your Table into a Show Stopper! 30 Ways to Repurpose Old Picture Frames You’ll Wish You’d Seen Sooner! 7 Gorgeous DIY Lazy Susan Ideas that Make the Perfect Table Accessory! 86 Reasons to Not Throw Away that Empty Altoids Tin! Adorable Baby Toy Sewing Patterns You Need to Make! DIY Notebook Designs that You Have to Make This Weekend! Make Your Own Diaper Clutch – So Much Cuter than a Ziplock! These Adorable DIY Mini Felt Dolls Will Become Favourite Playmates! Oh and don’t forget that self care is also about spending quality time with your loved ones, so check out our ultimate list of art and craft ideas for kids for projects you can work on together!